High-quality early childhood education is proven to dramatically improve a child’s opportunities for a better future—particularly children from low-income families. If we, as a nation, want to ensure all children have access to high-quality early learning, there must be strong support and partnerships from federal government to extend the reach or fill in the gaps of state efforts and innovation. 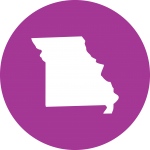 This fact sheet provides an abbreviated overview of state- and federally-funded early childhood opportunities in Missouri, which serve more than 150,000 children and families. Click here to view all state fact sheets.